To spark discussion, the Walker invites Twin Cities artists and critics to write overnight reviews of our performances. The ongoing Re:View series shares a diverse array of independent voices and opinions; it doesn’t reflect the views or opinions of the Walker or its curators. Today, artist, DJ, musician, and writer Danny Sigelman shares his perspective on OOIOO last night. Agree or disagree? Feel free to share your thoughts in comments! The McGuire Theater hosted two amazing performances last night. Quite different from visiting artists OOIOO, the Twin Cities-rooted Gamelan ensemble Sumunar kicked the evening off with a very traditional style under the direction of Javanese musician Joko Sutrisno. Humbly introducing each piece, Sutrisno lead Sumunar through a handful of tunes. With his 7 person group scattered about the stage, festooned by Gamelan instruments including bells, xylophones, delicately hanging gongs, Sutrisno set the tone with a short vocal intro while playing his set of hand drums to establish a rhythm. While the various mallets systematically danced about the bells they provided a depth of alternating, subtle melodies which became accented by stark rhythms, shifting in tone. Gradually Sutrisno picked up the tempo for a climax that ended in a sudden stop with each joyful work. With solid beats driving the final performance, the seemingly random nature of the music captured a hypnotic effect among the audience. Ultimately the musicians continued to find their stride with one another, trading off melodies and returned to a unifying theme to triumphantly finish their set. Heavily influenced by the same style of Gamelan music, it was ironic to see the stage hands setting up for the headliners. 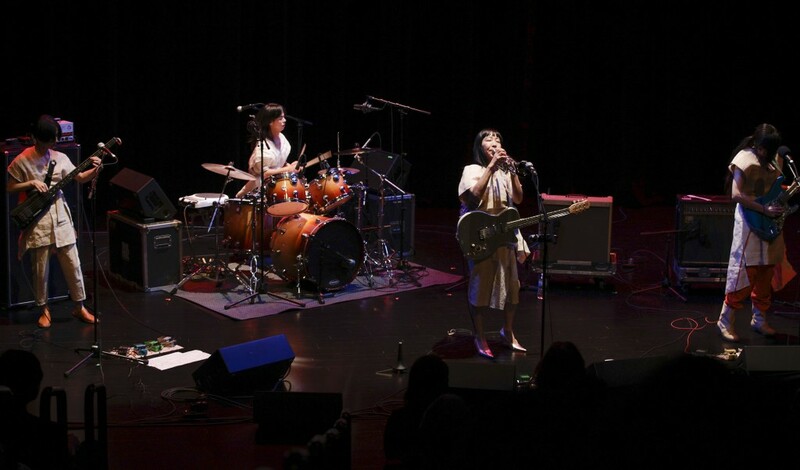 Quickly removing the traditional instruments from the stage, Walker staff meticulously moved in the guitar amps and drums for the Japanese experimental rock group. Linking some guitar pedals together a sonic burble burst out from the bass cabinet, providing a small glimpse of what was to come from OOIOO. Dressed in white robe-like outfits, the four women took to their instruments and immediate command of the stage. 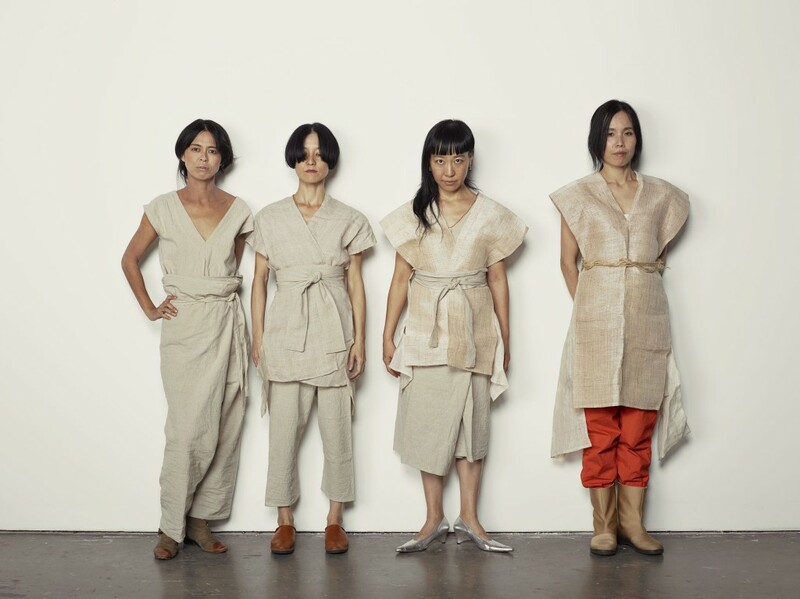 Without the rhythmic Gamelan instruments from their recordings, this was a more sparse and direct form of OOIOO that took more from No-Wave rock in their style and approach. To begin, vocalizing together, the four of them stretched out a harmony that conjured feedback trough the sound system. Coalescing to a fever pitch, drummer Ai introduced a rhythm that would remain constant virtually for the entire performance. Building up toward accents, the tribal rhythms and a meandering groove from bassist Aya laid a foundation for Yoshimi and second guitarist Kayan to repetitiously play counterpoint melodies with one another. Meeting each other along the way they’d continue to stretch the sound of their strings, often ending with one another playing a twin leads. Yoshimi’s vocals would blend with the melodies and would weave in and out, often treated with electronic effects. Her vocals sounded conversational at times leaving the audience to feel a story of sorts as the drums stopped and started often shifting into an altogether totally different rhythm. Continuing to ride an 80’s new wave sound, more effects were applied to the bass guitar’s sound, providing a fat groove that matched the funky rhythms Ai so seemingly effortlessly and masterfully employed. Matching one another once again later with a dub like quality, Kayan and Yoshimi dove into obtuse guitar riffs, treating their own instruments percussively with tapping and more enhanced tones. More marching drum type beats and echoing vocals took OOIOO and the audience into prog-rock territory with Yoshimi’s child-like vocal bursts above the cacophony and entrancing sound of the band. Sludgy bass lines and Ai performing patterns of tones on an electronic drum, the guitars rejoined with added dissonance, allowing for more spoken vocals and Yoshimi’s patented scream/singing. Evolving into a disco pattern that morphed into Math-rock it was a delight to not necessarily know where OOIOO was going to take each piece. While improvisation is certainly a part of the band’s formula, ultimately there is a pure structure that shows how well the women perform together, which was illustrated in the efforts when they’d rejoin each other with solid melodies and capturing rhythms. Sheepishly taking bows toward the audience OOIOO left the stage and the audience, truly wanting more, gave them an elongated standing ovation. Eventually the house lights came up and as everyone was grabbing their coats and getting ready to leave, the four women returned to the stage causing everyone to laugh with joy as they stayed in their seats for a couple more tunes. This was a really satisfying evening with OOIOO. For a group that has been around for 20 years, it’s remarkable this was the group’s Twin Cities debut. It’s been a sorrowful year for OOIOO since original founding member, Kyoko passed away in July. But as Yoshimi P-We and the band proved, the spirit of experimentation and organized chaos they so masterfully have carried on through the years continues to break new ground.